The two half-time provisional schools were closed at the end of the 1878 school year and a new school was built on two acres of land provided by Tom Petrie. 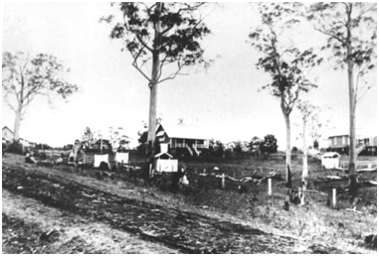 On 20 January 1879, the existing Petrie State School, first known as Pine River North State School, (then later as North Pine State School) opened with 73 pupils and Richard Binney as the first teacher. The original classroom measured 33 feet x 18 feet. In 1888, an extension 40 feet x 20 feet was constructed on the western side of the original classroom. In 1906 a playshed was constructed and in 1920 the original shingle roof was replaced by an iron roof. Many other buildings and improvements have been added to the school since 1934. 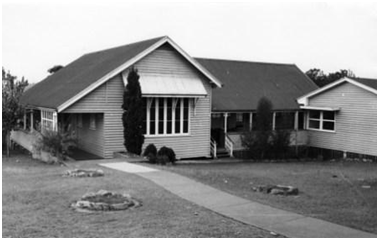 The change of name from North Pine State School to Petrie State School took place on 21 May 1956. Although the building has lost heritage significance through modification and additions, including cladding, it has major historical significance because of its age and its associations with Petrie and the development of local education facilities. The 1906 playshed has been moved and preserved in the North Pine Country Park.